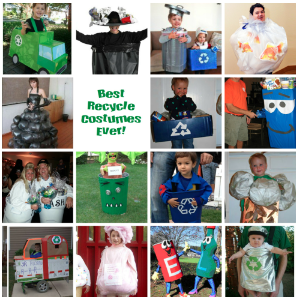 DIY Make a Recycle Bin Costume "
Earthday, America Recycles Day, Mardi Gras or Carnivale. 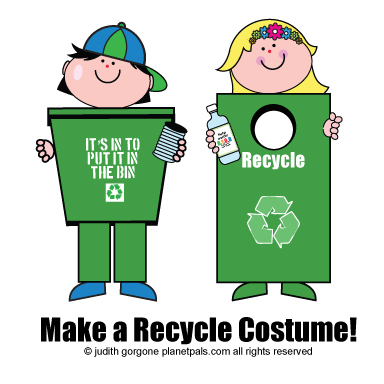 Here are two simple recycle bin costumes to make using recycled materials, too! How much easier can it get! *Note: Don't use sharp cans or glass bottles as a safety measure! You can either print the words and recycle symbol on the computer or freehand paint it. Add a hat to match if you like. Decorate your hat or headband. You can glue on bottle caps, cans, paper or plastic bottles to the box or to your hat or headband! Wear matching pants and shoes as an added extra. You can either print the words and recycle symbol out or freehand paint it. Decorate a matching hat or headband. You can glue on bottle caps, cans, paper or plastic bottles to the box or the hat or headband!